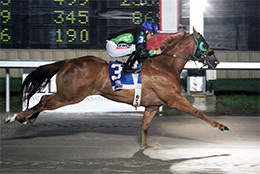 Eye N Cap, under jockey Jesse Levario, winning the $50,000 Miss Polly Classic Friday night at Delta Downs. VINTON, LA—JULY 6, 2018— Delta Downs continued its final week of American Quarter Horse racing for 2018 with a special program that featured the $50,000 Miss Polly Classic Stakes (G3) on Friday night. 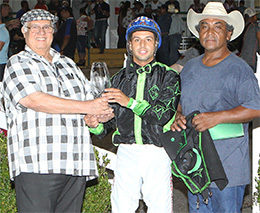 The headliner was won impressively by Ruben Garcia Montemayor’s Eye N Capo with jockey Jesse Lee Levario in the saddle. Eye N Capo broke sharply in the Miss Polly Classic, quickly put distance between himself and the rest of the field. He pulled away throughout the stretch and was never threatened, hitting the finish line 2-1/2 lengths clear of Fdp Rock Solid. The Golden Bowl finished another ¾ of a length behind in third. Eye N Capo covered 400 yards over a sloppy track in 19.392 seconds, which equaled a lofty speed index of 103. The win by Eye N Capo was his eighth from 13 career starts and his third tally in a row. He earned $30,000 for the effort on Saturday and his career bankroll now stands at $439,660. Bred in Oklahoma by Dee and/or Betty Raper, Eye N Capo is a 4-year-old sorrel gelding by Capo de Capi, out of the Mr Eye Opener mare Satisfeyen. Fdp Rock Solid picked up $10,000 for his second-place effort. Xavier Scott trains the Rock Solid Jess 4-year-old for owner Rene Amaro. Sarah Huskey bred the multiple graded stakes winner in Texas from the Deltas First Dash mare First Down Payment. David Alvarez was riding the $220,000+ earner. Also a Texas-bred, third-place finisher The Golden Bowl races for owner Rogelio Marquez, Jr. and trainer Jorge Lopez. Damian Martinez rode the Mr Eye Opener 6-year-old out of First Dashin Bye by Dashin Bye. Jorge Meraz is the breeder. The Golden Bowl pushed his earnings to $47,372 after pocketing his take $5,500 Miss Polly payday. Sent to the gate at odds of 1-2, Eye N Capo paid $3 to win, $2.40 to place and $2.10 to show. Fdp Rock Solid was worth $6.20 to place and $3.80 to show. The Golden Bowl returned $6.20 to show. Jes A Spitfire, Hez Kwik, Zenergetic and Gianni Que completed the field. Tf Racee Runaway was scratched. Delta Downs will close out its 46-day season on Saturday night with another edition of Louisiana Showcase Night. The 12-race program includes eight stakes races and the season’s richest event, the $700,000 Lee Berwick Futurity (RG1) for Louisiana-bred 2-year-old who qualified for the race back on June 16. There is a special early post time on Saturday of 5:45 pm Central Time.